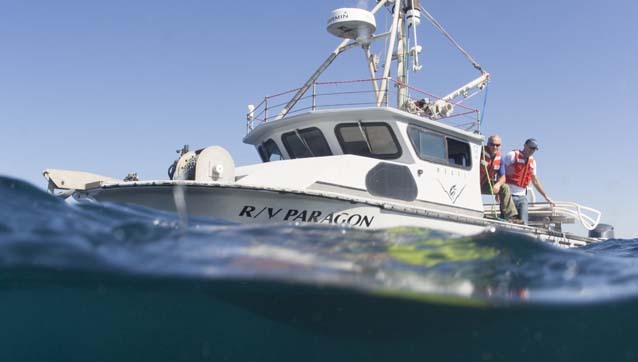 May 2, 2016 - The smallest member of the MBARI seagoing fleet, the R/V Paragon, often runs multiple missions in a day. A wide array of tools developed at MBARI are used for ocean research. The Division of Marine Operations operates MBARI’s ships, vehicles, moorings, and cabled observatory. This map shows the location of MBARI’s ships, instruments, and robotic vehicles in and around Monterey Bay. The map is updated every five minutes. Our three research vessels carry advanced technology to explore the ocean along the Pacific coast from Mexico to Canada. Several remotely operated vehicles (ROVs) and autonomous underwater vehicles (AUVs) are used in ocean experiments and exploratory missions. Instrumented moorings in Elkhorn Slough, Monterey Bay, and nearby waters collect valuable data of ocean properties. The Monterey Accelerated Research System (MARS) is a cabled observatory that provides deep-sea instruments with continuous power and high-speed communications.